My friend Amy put me onto this recipe about 8 years ago and since then it’s become one of my favourite dessert options for catering. It literally only takes a couple of minutes measuring and mixing and then it’s into a low oven for an hour and a quarter – allowing me to get other things done. I generally make it in the morning and leave it to cool in the switched off oven for the rest of the day. From there it’s ridiculously easy to whip cream and top it with whatever you like. Nigella suggests fresh raspberries on top but I’ve often used frozen ones and actually we all like it best with bananas, strawberries and a handful of maltesers dumped on top. Also, when cooking other desserts that call for egg yolks only, I keep the whites and freeze them in zip lock bags. They thaw out beautifully and this often means I don’t have to use new eggs – another money saver. This low fuss dessert will set you back about $8 and serves 10. Preheat the oven to 180°C/gas mark 4 and line a baking tray with baking parchment. Beat the egg whites until satiny peaks form, and then beat in the sugar a spoonful at a time until the meringue is stiff and shiny. Sprinkle over the cocoa and vinegar, and the chopped chocolate. Then gently fold everything until the cocoa is thoroughly mixed in. Mound on to a baking sheet in a fat circle approximately 23cm in diameter, smoothing the sides and top. Place in the oven, then immediately turn the temperature down to 150°C/gas mark 2 and cook for about one to one and a quarter hours. When it’s ready it should look crisp around the edges and on the sides and be dry on top, but when you prod the centre you should feel the promise of squidginess beneath your fingers. Turn off the oven and open the door slightly, and let the chocolate meringue disc cool completely.3. When you’re ready to serve, invert on to a big, flat-bottomed plate. Whisk the cream till thick but still soft and pile it on top of the meringue, then scatter over the raspberries. 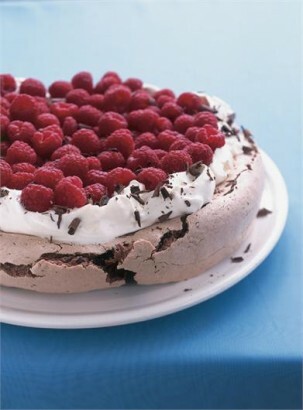 Coarsely grate the chocolate so that you get curls rather than rubble, as you don’t want the raspberries’ luscious colour and form to be obscured, and sprinkle haphazardly over the top, letting some fall, as it will, on the plate’s rim. I’ve made this before! Definitely good for a crowd.